Looking for ways to increase access and success in higher ed? 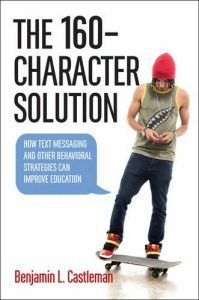 Using new technologies to provide personalized support and timely information can help students get to and through college, author Benjamin Castleman noted during a Wednesday #NACACreads Twitter chat. College counselors and admission professionals from across the country joined the hour-long chat, sharing their own experiences helping students chart a path to college. Text messages, in particular, can be especially effective in reaching teens and young adults, said Castleman, who was tapped to help the Obama White House create Up Next — a mobile messaging campaign aimed at boosting college access. Yet colleges and counselors shouldn’t become overly dependent on text messaging, he noted. But no matter the means of communication, students benefit when complex tasks (such as applying for college) are broken down into “digestible, actionable chunks,” said Castleman, an assistant professor of education and public policy at the University of Virginia. “Simply by keeping something top of mind for students…they are more likely to follow through,” he tweeted. Read the full chat transcript and learn more about #NACACreads.